Where Is This Child Prodigy Today? 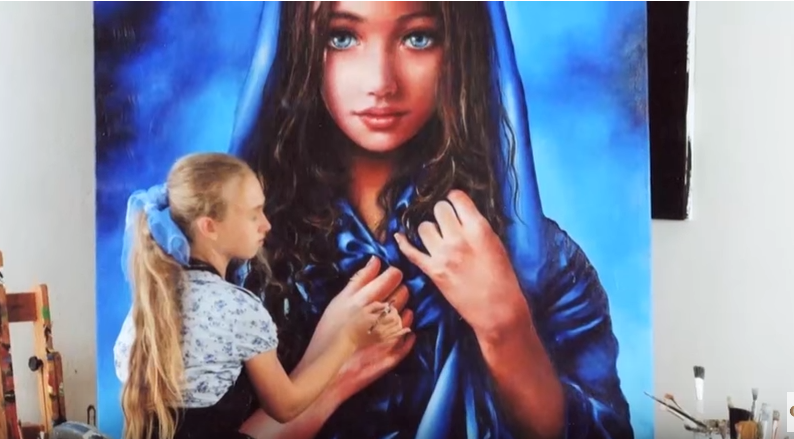 Akiane Kramarik was first introduced to the nation as a child prodigy in 2003 when she painted two pieces titled Prince of Peace: The Resurrection, and Father Forgive Them. The realism the young child was able to produce in her paintings alone is noteworthy, but it’s her reply when asked where her inspiration comes from that has everyone captivated! The two paintings are renditions of Jesus Christ that Akiane saw in what she describes as her “visions”. Akiane was born in 1994 in Mount Morris, Illinois. Her mother was a self-proclaimed atheist, and her father hailed from a non-practicing Catholic family. So when the 4-year-old started drawing with a realism beyond her years, proclaiming the talent and visions were gifts from God, her mother was taken aback. In several interviews, her mother explains that there is zero explanation as to how Akiane came to know about God or Jesus, or any of the other spiritually rich images she has created. The only explanation that has ever been given is the one that the young artist gives herself; she’s seen these people and places before, and God gave her the gift of her art to help bring people closer to Him. As if the supernatural talent emblazoned in her imagery weren’t enough, her claims of seeing the true face of Jesus were solidified when the NY Times national bestseller book was released Heaven Is For Real. The nonfiction book is about a young boy named Colton Burpo who had a near-death experience at the age of four. He had to undergo emergency surgery for a burst appendix and while he was on the table, he went to Heaven where he met angels, a great-grandpa he’d never met, and a miscarried sister he’d never been told about. After the boy told his parents things he couldn’t have possibly known, they started pressing him for as much detail about his trip to heaven as possible. One thing they would do is show Colton hundreds of images of the face of Jesus, and according to Colton, none of them came close to Him. Then one day, after three years of seeing and searching, Colton came across Akiane’s Prince of Peace: The Resurrection painting and told his father “They finally got it right!” Continue to the next page to see the otherworldly experiences rendered by this little angel’s paintbrush!